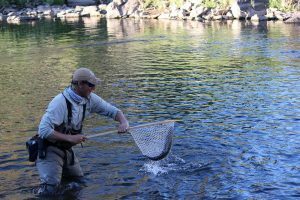 Wade fishing on the Eagle River has been nothing short of fantastic from the headwaters to the confluence. Flows are below 200 cfs for the summer and the boats will be other places. The public hot spots this week has been the Gypsum area and the headwaters above Minturn. While nymphing continues to produce most fish, be on the lookout for risers in low light conditions. Pmd’s, Yellow Sallies, Blue Quills, Terrestrials and of course Mr Caddis have been on the menu in abundance. When the fishing gets tough remember your midge box or a good old black ant.